I worked some 25 years in the building trades. There is precious little sitting when you're in that business. I can remember thinking how nice it would be to have a sit-down job. Then I got a sit-down job. After sitting for hours every day in that job, I came to realize it's not a good thing. The video above is a short summation of what's so bad about sitting for long periods. Our bodies were simply not created for extended chair sitting. I left my sedentary job in the prison system five years ago. I sit less now. But I still sit too much, especially in the winter months. So I'm looking to get a stand up desk. They are becoming a thing. 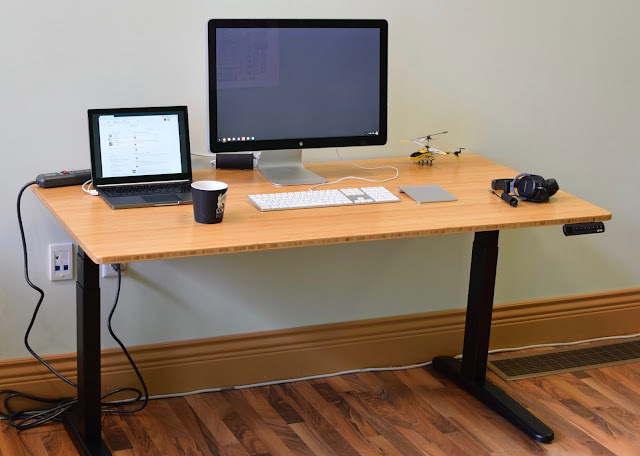 For now, the Jarvis Stand Up Desk (pictured above) is the one I'm leaning towards getting. The Frame Only is Available From Amazon (free shipping with Prime). I can get a top locally. Adjustable-height electric desks are kind of expensive. But the expense is deductible if you have a home business. I'm waiting to see what my accountant tells me about my 2017 income taxes before I buy a new desk. That's always a downer. I'm wondering.... Do any of you reading this have experience with a stand-up desk? P.S. I have taken the font size of this post down a notch from previous posts. Do you think it is better at this size for viewing? Or is the larger font more agreeable? I appreciate the feedback. IMO, the font size is fine. Font size is fine. The standing desk gets old too. I have one at work that has push buttons and a motor to raise it up/down. I suppose its nice to change position once in a while, but I get tired of standing. My job requires both computer work as well as work in a lab running equipment. I prefer to sit while I'm working on something that requires me to concentrate, but take breaks to go check on things in the lab. You might be able to do the same. My wife has an adjustable desk and loves it. She works long hours at her office at home and changes back and forth - sitting and standing - throughout the day, it doesn’t have to be all one or the other. Hey Eric - another DA fan in Ohio! I'm now in SW Ohio outside of Cincy (used to be up in NEOhio). Whereabouts are you located? ...and I’m a huge fan of DA and glad to see it’s back! I’m also a big fan of the Whizbang line of products - specifically the garden cart and the wheel hoe - neither of which I could ever be without! Eric - I used to be up by you; due west over in Summit county, Bath Township. NEOhio was great. I actually miss the winter, the history of that part of the state, and the parks. I'm also a fan of DA products - cider press/grinder is my favorite. Elizabeth L. Johnson said, I hadn't noticed, but the font is fine. If it is hard to read because the font is too small for old eyes, I just do the two finger spread till it is something I can read! Herrick, my contention on the standing desks is what I say about a lot of things - moderation in all things. I have a sitting job but I'm up moving quite a bit and can take long walks outside several times a day. That works for me. At home outside of winter I'm up and moving all day long in the yard or garden when I'm not out hiking or biking. There are a few folks at work with standing desks. One fellow said his feet get tired by mid afternoon and I've seen him move it back to a sitting position. Again, a mix is best. Hadn't noticed until you mentioned it, but the font size is fine. I do notice now that it is smaller than before. No experience with a standing desk... but I do sit too much, and yes, more so in the winter. My company purchased uplift desks for about half of all the employees so far. We love them! The key is to alternate between sitting and standing. Standing all the time is as bad as sitting all the time. I do like standing because I feel more aggressive in my work than I do when sitting. We buy them from upliftdesk.com. I think the basic version is about $400 plus some for accessories. Excellent. I have not checked out the UpliftDesk, and will definitely do so. Thanks, Jonathan. It's good to hear from you. Thanks for the feedback on stand-up desks, everyone. I think I would me less inclined to linger and waste time on my computer if the desk was in stand-up mode. I personally use a stand up desk at work. We're cheap so my stand up "desk" is some cleverly placed cardboard boxes sitting on top of my regular desk. I like it. I have a stool so if I need to sit down I can. When I moved to this I could tell a huge difference with how I felt when I got home in the afternoons. I was less tired and had more ambition to get things done I wanted to do around the homestead.